Virtual Reality (VR) can be defined as interactive computer graphics that provides viewer-centered perspective, large field of view and stereo. Head Mounted Displays (HMDs) and BOOMs (TM) achieve these features with small display screens which move with the viewer, close to the viewer's eyes. Projection-based displays , , supply these characteristics by placing large, fixed screens more distant from the viewer. 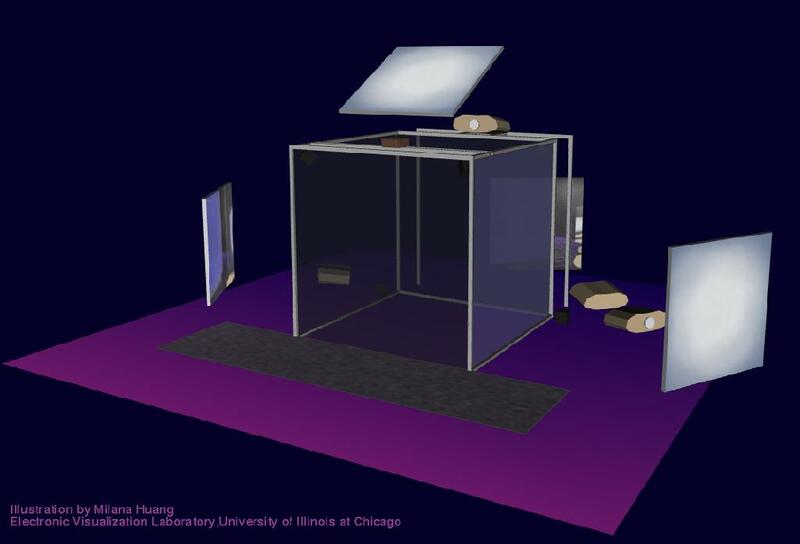 The Electronic Visualization Laboratory (EVL) of the University of Illinois at Chicago has specialized in projection-based VR systems. EVL's projection-based VR display, the CAVE(TM) , premiered at the SIGGRAPH '92 conference. In this article we present two new, CAVE-derived, projection-based VR displays developed at EVL: the ImmersaDesk(TM) and the Infinity Wall(TM), a VR version of the PowerWall . We describe the different requirements which led to their design, and compare these systems to other VR devices. The CAVE was developed to overcome some of the limitations of HMDs, especially for scientific applications. The major goals were to provide high resolution, a large field of view, and a stable display that did not encumber the viewer and would allow multiple people to easily share the VR experience. To achieve this, we surround the viewer with video projection displays, in combination with head tracking and stereoscopy. The CAVE is a multi-person 10x10x9 foot theater, with images rear- projected on the walls, which are screens, and projected down onto the floor. Four projectors, one for each screen, are connected to separate or split graphics pipes of one or more high-end workstations (Silicon Graphics Onyx Reality Engine 2 or Infinite Reality). In the current EVL configuration, 1024x768 resolution stereoscopic images are displayed on each screen at 96 Hz. Viewers wear Stereographics' liquid crystal shutter glasses to view the stereoscopic images. One user's head is tracked with an Ascension Technologies' Flock of Birds electro- magnetic, 6 degree-of-freedom tracking system, and images are generated from that user's viewpoint. A wand (3D equivalent of a mouse) is also tracked by the Flock of Birds. The wand has three buttons and a small, pressure-sensitive joystick; viewers use it to interact with and control CAVE applications. Applications are built on the CAVE library, which controls the display, tracking, and input systems. The CAVE library hides most of the device-specific details, automatically generates the correct, user-centered perspective for each screen, and synchronizes the screens to produce a single, nearly seamless display. The CAVE library also simulates the CAVE, allowing development of VR applications on ordinary graphics workstations . A computer-controlled audio system (the Vanilla Sound Server ) with multiple loudspeakers provides sonification capabilities. Over 25,000 people have experienced the CAVE at various conferences (*) and at a number of permanent installations (**). These showings featured over 100 applications by scientists and artists from very diverse fields, such as astrophysics, molecular biology, computational fluid dynamics, medical imaging, meteorology, mathematics, chemistry and the visual arts , , . The CAVE achieves the goals of producing a large angle of view, panorama (surrounding the user with images), and stereo high-resolution head tracked images in an environment where 5-10 people can share the experience. The ImmersaDesk was developed in 1994 at EVL. It is a drafting table format VR display. It features a 67x50-inch rear-projected screen at a 45-degree angle. Up to 5 users wear shutter glasses to view high resolution, stereoscopic, head tracked images. The ImmersaDesk screen mostly fills a user's field of view, and at the same time enables the user to look forward and down. One user's head is tracked, allowing an accurate perspective to be generated. A tracked wand is also used, so that the user can interact with the environment. The system is equipped with stereo sound supported by the Vanilla Sound Server. The ImmersaDesk cabinet is on wheels, and folds up and fits through doors. It can be deployed in offices, exhibition spaces, galleries or museums. The ImmersaDesk is significantly smaller than the CAVE, and it is also portable and self contained. 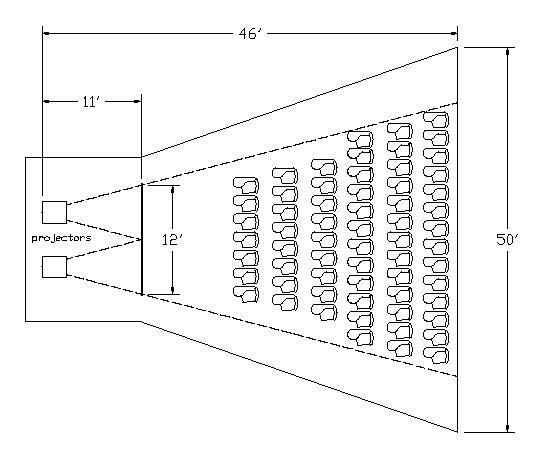 The projector is located in the lower section and a pop-up mirror folds the optics. The screen can rotate to the transportation position, where it is enclosed in the ImmersaDesk body, allowing the system to have a footprint of 34"Dx73"W.
Only one graphics pipe is needed for the ImmersaDesk, which allows the use of a less expensive mid-range workstation. The decision to tilt the screen 45 degrees came from experience with the CAVE. In the CAVE, users usually look at images that are displayed on the walls. This might suggest that the CAVE floor is not important. However, if the floor is not used, a significant part of the VR experience is lost. This prompted us to design the ImmersaDesk to support looking down, as well as forward. The ImmersaDesk user stands close to the screen, creating a 110 degree horizontal field of view. In that case, parts of the screen are viewed at large angles. In order for the entire image to appear uniformly bright, we chose a low gain screen. This screen is made of a clear plexiglass with sprayed on backcoating. All parts of the ImmersaDesk cabinet are made of wood or stainless steel, so as to minimize interference with the electromagnetic tracking system. We use the low cost Ascension Technologies' SpacePad system. However, its positional and angular accuracy is lower than that of the Flock of Birds system . 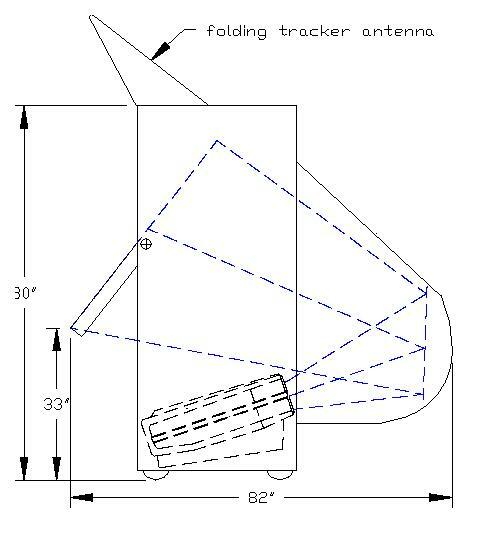 Currently, we are investigating the Ascension Technologies' PC Bird tracking system. 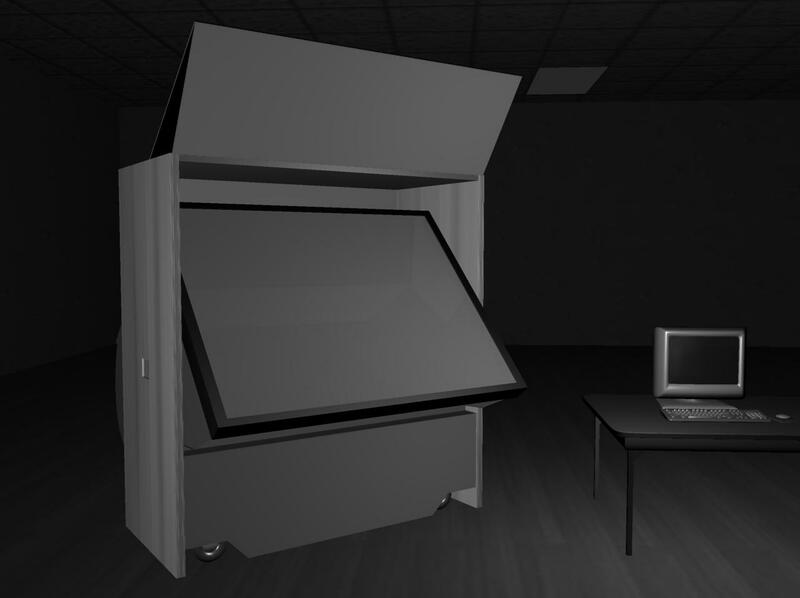 The ImmersaDesk uses the same CAVE library software as is used in the CAVE, to generate accurate perspective projection, and to read tracker and input devices. Therefore, applications developed for the CAVE can be run on the ImmersaDesk, and vice versa, without any code changes. More recently, we created a larger scale system, called the Infinity Wall. The Infinity Wall is designed around the same basic resources as the CAVE, but is intended for presentations to large groups, as in a classroom setting. It comprises a single 9x12 foot (or larger) screen, four projectors which tile the display, one or two SGI Onyxes to drive the display, and a Flock of Birds tracking system. In comparison to the CAVE, it trades reduced panorama for increased resolution on a single display. The Infinity Wall was first demonstrated in the GII Testbed  at the Supercomputing '95 conference. There are current plans to use Infinity Walls at the University of Illinois in Urbana/Champaign and the University of Illinois in Chicago for remote teaching of a Mechanical Engineering class between the two schools. The course will use the Walls to combine two-way video conferencing with high-resolution, interactive, 3D graphics, all shared over a high-speed network. The Infinity Wall display is an extension of the PowerWall, created by the University of Minnesota's Laboratory for Computational Science and Engineering. The PowerWall uses two Power Onyxes, each with two Reality Engine 2 pipes. The images from the different pipes are rear-projected onto a large screen, to create a single 3200x2400 pixel resolution display. The Infinity Wall enhances the PowerWall design with stereoscopic display and 6 degree of freedom tracking. The stereo display uses shutter glasses, as in the CAVE and ImmersaDesk. The stereo video formats in this case are of lower pixel resolution than the monoscopic video formats; the Infinity Wall has a net resolution of 2048x1536 pixels. We also experimented with passive polarized stereo. However, this required using front projection in order to preserve polarization. We will continue this work in the future, looking for rear-projection systems which preserve polarization better than those currently available. The most visually obvious problem in a tiled display, such as the Infinity Wall, is the seams between the different projectors' images. 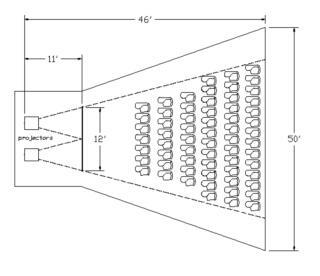 To reduce them, we follow a careful setup procedure to precisely match the geometry of the edges, and we use a very low-gain, very high-diffusion rear-projection screen to reduce the center-to-edge falloff in brightness. The tracking system can be used like that in the CAVE and ImmersaDesk, to generate a user-centered perspective display. However, because the Infinity Wall is intended for larger audiences, centering the perspective on a tracked user may not always be desirable. The projection can be fixed and the tracking used solely with the wand; this allows a presenter to interact with programs, with an acceptable stereoscopic display for the audience. This change is a simple system software reconfiguration, and is transparent to application programs. The Infinity Wall, like the ImmersaDesk, uses the same CAVE library software, to synchronize the displays and to generate accurate perspective projections for each of them. Except for issues related to the layout of the virtual environment, applications developed for the CAVE or ImmersaDesk can be run on the Infinity Wall. 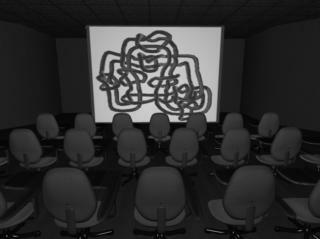 Projection-based systems allow for multiperson presentations; the only additional hardware that is needed for each paricipant is stereo glasses. People can share the VR experience, maintain visual contact, and communicate with each other naturally. The CAVE is characterized by a large field of view and panorama, and can accomodate up to 10 people. The negative aspects of the CAVE are that it is a large scale system (see figure 4), it requires 4 graphics pipes, and it requires a crew of trained people to construct and maintain it. These limitations were the primary motivation for the design of the ImmersaDesk, which is significantly smaller than the CAVE (see figure 5), needs only one graphics pipe, and is portable and easily deployable. On the other hand, it can only accommodate up to 5 people and doesn't provide panorama, so it is less suitable for viewing large-scale environments. The Responsive Workbench is a device similar to the ImmersaDesk. It is a rear-projected table, with a horizontal screen. One significant difference between the ImmersaDesk and the Workbench is the 45 degree rotation of the ImmersaDesk screen. This makes the Workbench better suited for tasks that, in the real world, would be performed on a table. However, using the ImmersaDesk, participants are able to see both the fronts and the tops of models. While the CAVE and the ImmersaDesk are good for presenting work to small groups, they cannot easily handle more than five to ten people at a time. An Infinity Wall can easily be viewed by much larger groups (see figure 6). The geometry of the Infinity Wall also makes more efficient use of space than the CAVE; it can fit into a normal classroom, rather than taking up an entire room itself. It is easy to share the VR experience in a projection-based system. Although only one user is tracked, others, if they stand close enough to the tracked user, can still view scenes from nearly the correct perspective. This feature comes for free with all projection-based systems. Users can communicate naturally, and maintain visual contact and observe each other's gestures. This is not true for HMDs and BOOMs, where other users have to have their own "personal" displays to participate in the experience, and where synthetic avatars must be used. An HMD is carried on the user's head, and the weight of the display is on the neck. The BOOM employs a counterweight to overcome this problem. In projection-based systems, users wear only lightweight (3.3 oz) glasses. HMDs and BOOMs provide images which completely surround the viewer. We are not aware of a projection system that completely surrounds the user with images; however, in principle, the CAVE could be extended to be a full cube. The ImmersaDesk and Responsive Workbench provide only a limited panorama. 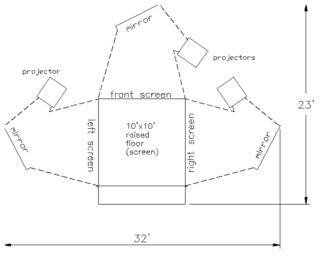 In projection systems, head rotation causes the projection point to move by only a few inches. This has a relatively minor effect on the displayed image. With HMDs or BOOMs, the whole world "rotates" with head rotation. This makes these devices more sensitive to head-rotation errors caused by rotational errors of the tracker, or errors caused by tracker latency . Furthermore, in projection-based systems, users can see real-world objects. Therefore, there is no need to model hands and input devices. This is advantageous if someone is interested in superimposing real and virtual objects. This feature is used by Caterpillar in their CAVE driving simulation, where a user holds a real steering wheel and can access levers and switches. It can be a drawback as well, because real objects can occlude virtual objects that are supposed to be closer to the user; this causes a depth cue conflict between occlusion and stereoscopy. Also, in these systems it is impossible to change the representation of a user's body - you will always see your real world body. HMDs usually require the use of non-linear optics to achieve a wide field of view. This causes distortion, which requires computational correction. Projection-based systems, on the other hand, can be linear displays and hence do not have distortion problems. This is especially important when applications superimpose reality and VR, or where precise quantitative judgments have to be made based on the VR experience. Most projection systems don't operate well in brightly lit environments. This is not a problem for HMDs, where the display is sealed from outside light. However, in that case the viewer is also cut off completely from reality. In extreme cases a human attendent has to protect the user from falling over. While the ImmersaDesk and the CAVE allow multiple people to share a VR display and work together, only one person is tracked. Images are rendered from the tracked user's perspective, so non-tracked users do not see a physically accurate image from their viewpoints. This can cause problems, such as when a non-tracked user attempts to point to a virtual object; without an accurate perspective display, he will not see the object in the correct position. For a virtual world to be more perfectly shared, all of the users must be tracked and see images rendered for their viewpoints. We have performed initial experiments with 2 different approaches to solve the problem of displaying multiple users' views on a single ImmersaDesk screen. The first was frame sequential. The system displays the first user's left eye view, then the second user's left, then the first user's right and finally the second user's right eye view. We used shutter glasses similar to those used in the CAVE. The other approach involved polarization to separate the users' views, and field sequential for each user's left and right eyes. The results were promising, but more work is still required. As mentioned earlier, the most significant problem when setting up an Infinity Wall is eliminating seams between the images from the four projectors. In future designs, we plan to use projection systems that provide zoned contrast control, to help make the brightness constant across the images. We will also use electronic blending in order to overlap the edges of the different projectors' images. Current projection-based systems are less invasive than HMDs, and we want to improve them even more by using tetherless, infrared tracking. We are also experimenting with passive polarization in order to use simpler, inexpensive stereo glasses. Thanks to Maggie Rawlings for pushing to make the ImmersaDesk a reality, not just the theory. Figure 1 was created by Milana Huang, figures 2 and 3 by Alan Cruz. 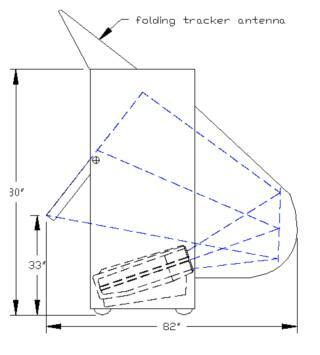 Figures 4, 5, and 6 courtesy of Pyramid Systems, Inc. Thanks to Hisham Bizri for proofreading. This work has been supported in part by the National Science Foundation grants CDA-9303433 and CDA-9512272. 1. Cruz-Neira, Carolina, J. Leigh, M. Papka, C. Barnes, S. Cohen, S. Das, R. Engelmann, R. Hudson, T. Roy, L. Siegel, C. Vasilakis, T. DeFanti, D. Sandin, Scientists in Wonderland: A Report on Visualization Applications in the CAVE Virtual Reality Environment. IEEE Symposium in Research Frontiers in Virtual Reality, Visualization 93, San Jose, CA, (October 1993) pp 59-66. 3. Cruz-Neira, Carolina, D. Sandin, T. DeFanti, R. Kenyon, J. Hart, The CAVE - Audio Visual Experience Automatic Virtual Environment. Communications of the ACM 35, 6 (June 1992) pp. 65-72. 4. Das, Sumit, T. DeFanti, D. Sandin, An Organization For High- Level Interactive Control of Sound. In Proceedings of International Conference on Auditory Display (Santa Fe, New Mexico, November 1994). 8. Krueger, Wolfgang, B. Froehlich, The Responsive Workbench. Computer Graphics and Applications 14, 3 (May 1994), pp. 12-15. * SIGGRAPH '92 and '94, Supercomputing '92, '93 and '95, National Association of Broadcasters '93, Radiological Society of North America '92. ** EVL, National Center for SuperComputing Applications, Argonne National Laboratory, Defense Advanced Research Projects Agency, Ars Electronica Center, a dozen other laboratories and Universities. CAVE and ImmersaDesk are trademarks of University of Illinois Board of Trustees. BOOM is a registered trademark of Fakespace.